I must say, I bumped into your site by accident, and I love it! I also share your passion for Las Vegas. Gathering that you are not originally from “Euchre Country,” you may not be familiar with my favorite card game, euchre. I would like to invite you to check out one of our games (which I am trying to spread the word about) over at Money Plays on Flamingo near Decatur. My website: vegaseuchre.com will explain more perhaps. It would be a pleasure to meet you, and perhaps have a beer or wine and a friendly card game. Although it might be argued that it’s not a great move for a woman to go alone to a strange bar to play cards with a strange man, and I could have just replied with a quick “Thanks, but no thanks,” I didn’t. 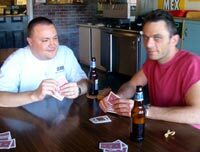 First off, I’ve always been faintly aware of euchre, but I knew nothing about how to play. And I’d heard something about how popular the game is on college campuses in certain areas. Where? I had no idea. “Euchre Country” was unexplored territory for me. Lastly, I like good games, and if euchre qualified as Harvey Lapp’s “favorite,” well, why not say yes and find out why? From checking out Harvey’s Web site, I gained a bit of a feel for the game and how passionate the people who play it can be. I accepted his invitation to attend a tournament, and on a recent Thursday evening, I headed over to Money Plays. Traffic was dense, and I was stuck in a slow lane near the corner of Decatur and Flamingo when a vintage white Mustang pulled into the right lane beside me. As it passed, I couldn’t help noticing the large “VEGASEUCHRE.COM” decal on the back window. When it turned onto a little side street, I figured I might as well follow. Sure enough, the white Mustang’s driver knew a sweet little shortcut to Money Plays. The white Mustang’s driver turned out to be Tommy D., euchre tournament director. Riding shotgun was none other than Harvey “the Rabbit” Lapp, vegaseuchre.com’s Webmaster. I identified myself and followed them inside Money Plays, a friendly neighborhood tavern whose owner welcomes Las Vegas euchre buffs twice a month for tournaments. Harvey, who by day deals craps at the Las Vegas Hilton, and Tommy, who works for a major printing house in town, gave me a basic lesson in euchre play and a few beginner tips on strategy. I guess if I had to describe it, I’d say euchre is a little bit hearts and a little bit whist. More importantly, it’s a whole lot of fun. While I didn’t feel competent enough to participate in the tournament that night, I did catch the euchre bug. I have a weakness for games that move at a quick pace, require strategy, and still have an element of luck. Euchre reminds me of backgammon, too. About a dozen people showed up to play in the tournament. The buy-in is $15, and the winner gets most of the cash. Second and third place winners get some, too, but money’s not the point, both Tommy D. and Harv said. The money just adds to the entertainment value. “Euchre Country,” it turns out, is the upper Midwest. The game is wildly popular in Michigan, Wisconsin, Illinois, Indiana, and even Pennsylvania and upstate New York, which is where Tommy D. and Harvey are originally from. When Harvey lived in Louisiana, he had a hard time finding a game. “Everybody plays spades there,” he said. But here in Las Vegas, he believes, where everybody is from someplace else, there simply must be a significant number of euchre lovers. The trick is finding them and letting them know there’s a friendly game in town. After my evening at Money Plays, I haven’t stopped telling people. I don’t know many euchre aficionados, but I’m rapidly becoming one myself. When I’ve practiced enough against the robots on my computer, I’ll be heading back over to Money Plays one of these Thursday nights. It’s great to know that a friendly game awaits, and that Las Vegas has a little piece of “Euchre Country” near the corner of Decatur and Flamingo.